FILE - Police patrol outside Iran's parliament building, in Tehran, Iran, June 7, 2017. Scattered protests, along with a heavy police presence in many places were reported Wednesday across Iran, one day after the first round of new U.S. economic sanctions went into effect. 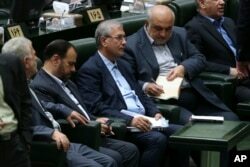 The Iranian parliament voted to remove Labor Minister Ali Rabie during a raucous debate Wednesday on new economic policies to tackle unemployment and bolster the weak economic situation in the country, a day after new U.S. economic sanctions went into effect. 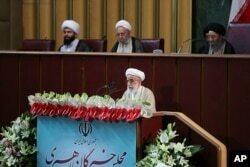 Tuesday, the hardline leader of Iran's Assembly of Experts, Ayatollah Ahmad Jannati, urged President Hassan Rouhani to replace all his ministers. FILE - In this photo released by the official website of the office of the Iranian Presidency, Ayatollah Ahmad Jannati speaks during inaugural meeting of the Assembly of Experts in Tehran, May 24, 2016. Amateur video on social media showed a crowd of protesters Tuesday in front of the country's central bank demanding a failed government credit union return their money. Also Tuesday, a number of people were reportedly injured when security forces cracked down on protesters in the town of Malek Shahr, outside of Isfahan. Amateur video showed victims lying on the ground and shouting. Social media also showed a long line of trucks parked alongside a highway, on the 17th day of a nation-wide truckers' strike. It was not immediately clear how much the strike is affecting the flow of goods. Iran's Labor Minister Ali Rabiei, center left, listens to a speaker during his impeachment hearing in an open session of parliament, in Tehran, Aug. 8, 2018. Other video distributed Wednesday showed a heavy police presence in a number of places, including a government security convoy stationed along a major highway near Bandar Abbas, in apparent anticipation of possible protests in the area. Former Iranian diplomat and political commentator Mehrdad Khonsari tells VOA he does not think the protests represent an "existential threat" to the regime, but the new U.S. sanctions are undoubtedly "placing a good deal of pressure on the government," said Khonsari. "I think that Iran is more or less ready to break the old taboo of talking with the U.S., but they would probably want to see a suspension of sanctions while the talks are going on," he added. Khonsari believes Iran "has the moral high ground" since it was the United States that broke the 2015 nuclear agreement (JCPOA) with the five permanent security council members and Germany. U.S. President Donald Trump said he pulled out of the international nuclear pact because it was "a horrible, one-sided deal" that "failed to achieve the fundamental objective of blocking all paths to an Iranian nuclear bomb." He said the deal allowed Iran to support terrorism and militant proxies around the world, undermine the international financial system, and threaten the United States and its allies. Iranian Foreign Minister Mohamad Javad Zarif castigated Trump for "threatening" Iran and other nations, saying in a tweet "the world won't follow impulsive tweeted diktats." He also told journalists the United States is being hypocritical. 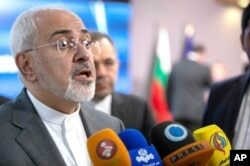 He says the United States pretends it is concerned about the Iranian people, but the first set of sanctions it imposed was on the sale of passenger jets, endangering ordinary Iranians. Arab media reported Wednesday that Oman and Switzerland had offered to mediate between the two countries. Oman was one of the main mediators during the lead-up to the 2015 nuclear deal.